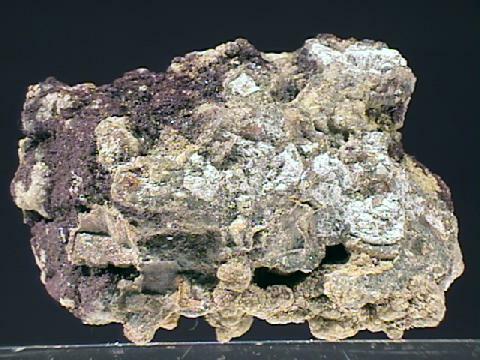 Selenium is a very rare mineral. It is scarce wherever it is found and it is not found too often. The color is a distinctive red-gray with a metallic luster. This is quite different from its closest related element, sulfur, which is vitreous and yellow. It is more similar in color to native tellurium which follows selenium in the same Periodic Table of Elements column. Elements found in the same column of the Periodic Table of Elements tend to have similar properties although those properties also tend to strengthen or diminish either up or down the column. On the left is the column from the Periodic Table of Elements in which selenium appears. The farther down the column, the more metallic in character the element becomes. So that oxygen is the least metallic and polonium is the most metallic of the elements in this column. The dividing line between metals and non-metals is between selenium and tellurium; making these elements semi-metals, an element that has significant characteristics of both metals and non-metals. Tellurium is more metallic in nature than selenium but is still a semi-metal. Although selenium has a metallic luster, it is not metallic in crystal structure or bonding characteristics. Its bonds are more covalent in nature and its structure is more spread out than in metallic minerals such as copper and iron. Both of these elements have lighter atoms than selenium and yet in crystalline form each is nearly twice the density of crystalline selenium. With metallic bonded crystals, atoms are comparatively much closer and are nearly in contact with each other with respect to covalently bonded crystals. The element selenium has many industrial uses. Most notable is the use of selenium for photvoltaic and photoconductive purposes. This makes it valuable for use in photoelectric cells and exposure meters for photographic purposes. Selenium is also a good tracer element for medical purposes and as a isotope tracer in ground water for hydrogeologic purposes since there are as many as six stable natural isotopes of selenium. The more isotopes, the more control a scientist has over aberrant abundances. Selenium the mineral, or native selenium, does not usually form good crystals but when it does they are steep rhombohedrons or tiny acicular (hair-like) crystals. Massive specimens are also known. Selenium is an interesting element that rarely forms good specimens. A specimen of good quality is therefore a real treat for a collector of native elements. Color is reddish-gray to red. Crystal Habits include steep rhombohedrons or tiny acicular (hair-like) crystals. Massive specimens are also known.. Specific Gravity is 4.8 (average for metallic minerals). Notable Occurrences include Jerome, Yavapai County, Arizona; Gold Quarry Mine and Willard Mine, Nevada and the Darwin Mine, California, USA; Moctezuma, Sonora, Mexico; Monte Vesuvius, Italy; Harz Mountains, Germany; Potosi, Bolivia and Los Llantenes, Argentina. Best Field Indicators are color, density, hardness and locality.